There are many reputable fence companies that sell vinyl fencing over the internet but there are also many individuals that have created companies and websites that sell fencing and in actuality never see or touch the product. They simply mark up the product and sell it to you. The following illustrates this process. 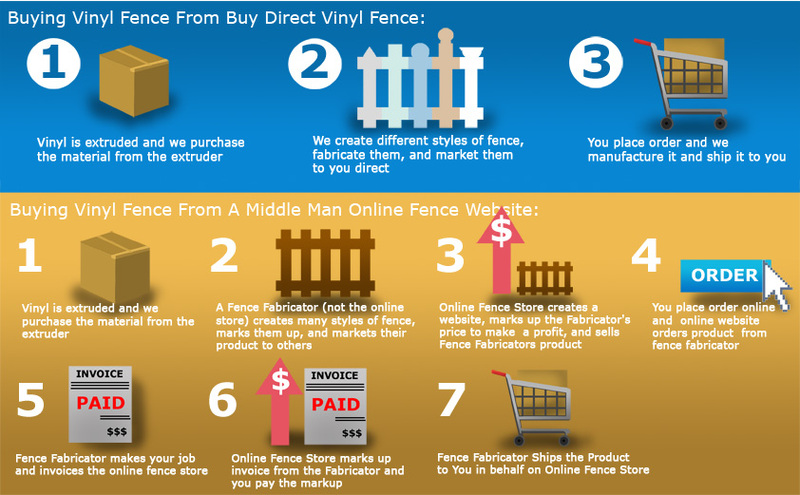 Some on-line vinyl fence stores don't even publish their address for their place of business, they are an individual with a desk and a computer. These individuals typically will just mark up the product and re-sale the fencing to you and you may or may not pay more than had you purchased from a reputable fence company direct. The danger is not so much that you will pay more, it is that these companies tend to purchase products from whomever or wherever to stay competitive. These individuals have very little invested in the company and simply disappear over time. They are not around when you need replacement parts or in the event that you have a warranty issue. At Buy Direct Vinyl Fence, we publish our address so you see and know exactly who you are buying from. We have been in the Fence business since 1999 and we will be around when you need help again down the road. You can purchase with confidence when you buy your vinyl from us, we are fence experts in the industry that know and understand your fencing needs.